When installing or repairing your flat roof, it is important that you seek the work of skilled roofers. 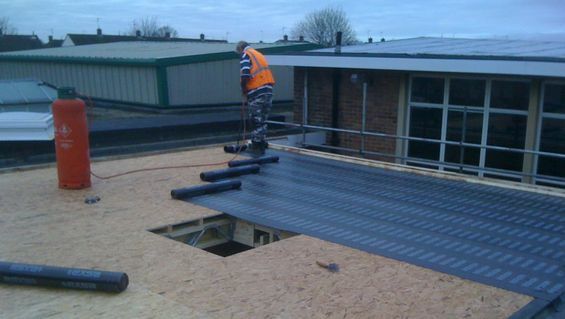 Since 1977, Hemisphere Roofing has provided flat roof installations and repairs to customers in Corby, Northamptonshire. We stock a range of roofing from felt to single-ply, always ensuring our quality services suit your needs. We will make an initial visit to your property to assess the task at hand, before deciding if repairs are possible or a new roof is required. Within 48 hours of your initial consultation you’ll receive a written quote, and once agreed you’ll be booked in our next available slot which is typically within 2 to 3 weeks. We will also discuss the guarantee that comes with your roof, with all our roofing coming with either a 10-, 15-, or 20-year guarantee. Our new range of felt flat roofing combines multi-layered longevity and water protection, but we also supply single-ply flat roofs and insulated roofs to cater to your needs. If you suspect an issue our roofers are on emergency callouts 24/7 to provide a range of repairs, including covering holes and leaks in the roof as well as damage to outlets and leadwork. Contact us for more information on the flat roof installations and repairs our expert roofers provide for customers in Corby, Northamptonshire and surrounding areas.